What a great week in Chicago! We just completed a Rescue Bear team building event for 450 people from the Deloitte organization. Deloitte is one of the largest professional services organizations in the world and one of the Big Four auditors, along with PricewaterhouseCoopers, Ernst & Young, and KPM group. 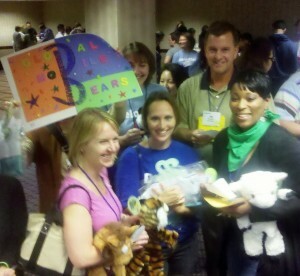 In our fabulous team building event the group built over 200 stuffed animals to comfort children in need. Sgr Keith Kania from the Rosemont Fire and Rescue Department accepted these gifts and said a few words about how these toys will be used to comfort children in stressful and emergency situations. It was an exciting and dynamic event that will be remembered by all involved. Thank you Deloitte for your generosity and for being of service to your community.